The bakers who love precision, measurements and the safety of following recipes. The free-form cooks who love experimentation and substitution. Who see recipes as a souce of inspiration but can never resist the urge to tweak at least one thing. – which best describes you? Recently I was chatting to Victoria from Bite Size Cooking about my book ‘and the love is free’ – mum a life with recipes. We were discussing the two types of cooks. My Mum was definitely a baker with her talent for cakes and scones and caramel slice. When asked about myself, however I had to think for a while. My initial response was that I fall into the free-form camp. Like most food bloggers, I love improvising and trying new things. But when I think about my professional life as a food scientist and biscuit (cookie) designer, I had to admit that actually I have learned to be a baker too. Which got me thinking that maybe it’s wrong to lump people into one category or the other. Just because someone is a free-form cook in the savoury arena, doesn’t mean they can’t learn to be a baker when it comes down to it. So I’ve pulled together a few insights, learned on the job, that have helped me become a better baker. I hope you find them useful. i. Invest in a set of kitchen scales. If there’s only one thing you take away from this post – kitchen scales are a MUST. Not only do they make sure you’re measuring out the correct quantity every time, they are also a lot quicker to use than messing around with different sized cups and spoons. Just like snowflakes, every oven is unique and different. The trick is to figure out the quirks of your own oven. An oven thermometer can help. The other key thing is to keep in mind whether you’re using fan forced or conventional. Most cookbooks use one or the other but don’t mention it in each recipe (I’m guilty of this as well). Check the index or ‘cooking notes’ section and adjust your oven temp accordingly – subtract 20C (50F) for fan forced ovens. iii. Use a ‘rising oven’ profile. In commercial bakeries we use long continuous ovens. Biscuits enter at one end and then bake as they travel though the oven. This means we can vary the temperature at different stages of the baking process. Typically cookies and biscuits are cooked with a ‘rising oven’ profile. This means that they start out at a lower temperature and then are gradually exposed to higher temperatures. The key benefits of this is that it allows the middles of the cookies to get cooked evenly rather than having a cookie that is very dark on the outside and raw in the middle. One way to replicate this ‘rising oven’ profile in your home is to preheat your oven to a low temperature then increase the set temperature once you start to bake. I’ve included this method in the chocolate chip recipe below. iv. Know the difference between Bicarb Soda (Baking Soda) and Baking Powder. Bicarb Soda and Baking Soda are the same thing – a simple chemical which reacts with the moisture in the dough to produce carbon dioxide gas which expands in your baked product and causes it to rise. Too much of it can leave a ‘soapy’ flavour in your cakes or cookies. Baking Powder has a mixture of this chemical with an acid. It still gives the gas production to allow things to rise but the acid neutralises any leftover chemical so you avoid the unpleasant soapy taste. Make a note of which your recipe calls for and stick to it – a teaspoon of one isn’t the same as a teaspoon of the other. v. Ingredient temperature is important. Cold hard butter straight from the fridge is almost impossible to cream properly and can actually damage your mixer. Make sure you let it come up to room temperature first – or carefully soften it in the microwave. vi. Rough edges make for a more natural look. This is a personal style thing. 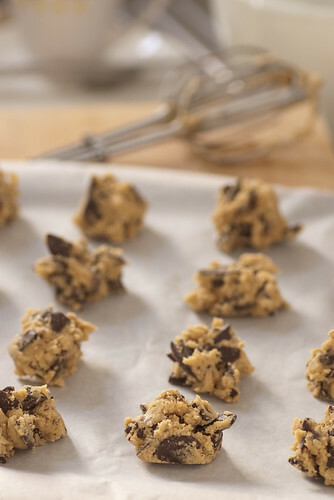 The more you shape and smooth your cookie dough, the smoother and more regular the final product. vii. It’s OK to add water. This is a tip I picked up from brilliant pasrty chef Lorraine Godsmark. It applies to both cookies and pastry. Basically the amount of moisture your product needs is always variable. From the humidity on the day to the age and protein content of your flour, water content is something that always needs tweaking. Professional bakers are always adjusting their water so don’t be afraid to add a splash if your dough feels too dry. It may feel a little nerdy but if you do decide to risk it and play around with the recipe, record what you did. If it all works fabulously, you’ll be able to repeat your success. I’ve been playing around with the best type of chocolate for cookie making and I’m surprising myself to report that I actually prefer dark chocolate around 50-60% cocoa solids rather than my usual love – Lindt 70% cocoa solids. In cookies I found my old faithful a bit too intense and rich. I hope I’m not going to get kicked out of the dark chocolate lovers club for admitting that. The other thing I’ve experimented with is chip size. No prizes for guessing that the larger chunks tended to give more textural contrast and a more interesting cookie experience. I’ve also given a range chocolate addition rates. Basically most cookie recipes tend to hover around my lower level of 30% chocolate but from experience 40% is much more decadent and fun. But it’s all up to individual preference and your budget really. Preheat oven to 150C (300F) [fan forced 130C (250F)]. Combine flour and baking powder in a medium bowl. Using a stand mixer, cream the butter and sugar – which just means to beat it over a medium speed until the mixture is light and fluffy. Add in egg and vanilla and beat until well combined. Scrape down the mixer. Add the creamed butter to the flour and fold though with a wooden spoon until the flour is just incorporated and the mixture no longer looks ‘dusty’. Gently fold through your chocolate chips or chunks. Using a teaspoon, scoop up little balls of dough about the size of a walnut, keeping them as rough as possible. Place on a baking tray lined with baking paper or a non stick tray. Make sure you leave enough space to allow your cookies to spread. I generally divide the mixture into two and cook half on the first tray and then the other half later on. Place the first tray on the middle shelf of your oven and increase the heat to 200C (400F) [fan forced 180C (350F)]. Set your timer for 10 minutes and turn the tray after that. Continue to cook, checking every couple of minutes until the cookies are just golden. Depending on your cookie size and oven they will take from about 13 to 18 minutes. Remove and allow to cool on the tray. Repeat with remaining mixture, allowing your oven to cool back down to about 150C before you start to bake. Once they are cool, store in an airtight container for a few weeks, if they last that long. *Listen to my conversation with Victoria click HERE. A big THANKYOU to everyone who made it along to my book signing in Cabinet bar in Melbourne yesterday. So much fun. For those of you who missed out – get your own copy of ‘and the love is free’ from my online bookstore HERE. Don’t miss out on the FREE SHIPPING anywhere in Australia and your 8 FREE SAMPLE RECIPES. I’ll see to it that you don’t get kicked out of the dark chocolate lovers club. I mean, it’s not like you used *milk* chocolate chips or anything. Gorgeous photos, as always. I haven’t made cc cookies in ages and must change that this week. Just been so hot to bake, let alone turn on the oven. I am most definitely a free form baker, I rarely follow directions and then I seem to always forget to write down what I just created. I love both baking and cooking, Jules, and these cookies are calling out my name! All about the free-form, “rustic” cookies–although I’m always impressed by cooks who are more careful than I.
Everyone’s doing choc chip cookies! I remember my first choc chip cookies many moons ago were a disaster so I’ve never tried making them since… but I think it’s time to tackle this once again. Thanks for such an informative post – I am giong to have to try out the rising oven and see how it helps my biscuits. I do the reverse with salmon – a falling oven where you start very hot (240ish I think) and drop to low (260ish) when the salmon goes in on pre-heated trays. You wind up with crisp skin but lovely medium rare insides. the ones in the last photo with the big chunks are the 70% lindt chocolate that I just cut up into chunks. They look so good I think I’m going to have to make another batch and reconsider my comments about 70% cocoa solids chunks in cookies. It’s a bit confusing but the 40% I was referring to was the amount of chocolate in the dough not the cocoa content of the chocolate itself. My preferred chips were ones I got from work (every job should have a perk like that) that were from Barry Callebaut and were about 55% cocoa solids I think. But basically if the chocolate tastes good on its own it will be fine to use in your cookies. 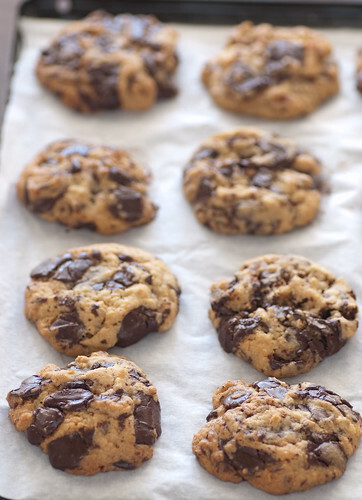 the chewy v’s crunchiness depends on how well you bake them. I’ve made some batches that I think were over baked and a bit on the crunchy side but others that I nailed which were a little bit chewy but not too much. Hadn’t thought of using a falling oven for other things. Was planning to roast a big fish for a family dinner this weekend so will have to try out your suggestion. I love your recipes but should this really be 2T vanilla extract? Cue Sunday nights at our house when the 5 boys were younger. This working Mum would always put a batch of CC Cookies (quadruple the recipe to make approx. 180u.) into the oven & then a chocolate cake (quadruple the recipe again!) into 2 lined roasting pans to make gigantic slabs. Ice the cakes & voila all done for a week of lunch-boxes. Except for one thing – they’d be all gone by Wed. night!! Thanks for the memories Jules – your recipe looks magic. I’m definately a free-form cook. Recipes are just a suggestion. I might follow the recipe to a T the first time, but after that I tweak. I’m much more accurate when I bake, but most recipes have a margin of error anyway. I’m def a freestyle baker – I never use any form of measuring impliments or beaters/mixers. I do it all by hand including making my own butter. Problem is I can’t cook with measuring cups or follow recipes – if I do disaster! I failed the baking assesment of home ec because we had to use all the measuring cups etc – I can’t understand it! That said I’m actually quite famous among my friends, work collegues and eldery neighbours for my baking and have never really had a failure since I was about 12. My father was a pastry chef a baker and a regular chef and taught me to bake from about age 6 – (not like other children learn by having a turn at mixing and licking the bowl). But actually understanding the ingredients and the batter texture required for different results etc. thanks for sharing your story. glad to hear there are free-style bakers out there. you are very lucky to have had a dad who could teach you the skill and art of baking. my dad taught me how to make porridge and boil the kettle and that’s about it. I just made these as a welcome home treat for my fiancee. The problem with this recipe is that I don’t know if they will last from now until airport pick-up time. The proximity of the cookies to my mouth is too near! chunks are totally the best. i tried the recipe but my cookies fell flat and browned only at the edges. any idea what i did wrong? thank you! 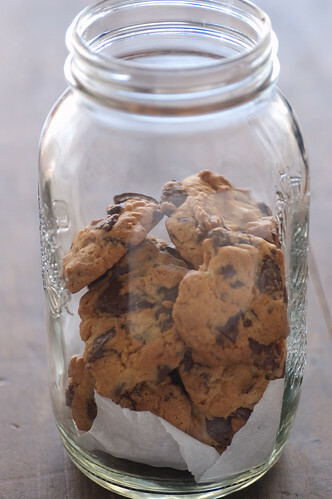 at last I’ve found the perfect choc chip cookie recipe, thank you! Thought that they were maybe a little too sweet, or was that because I ate too many in one sitting ?! Would reducing sugar change the outcome re Texture etc ?? sorry, I must have missed your comment earlier. sugar will have a big impact on texture, but not necessarily in a bad way – will change how much they spread and the chewiness… the best way to find out is to give them a go!